Our Delmarva Peninsula weekend had just begun, and already half of our group had to leave. Before he hit the road, we dragged Sara’s cousin, Hunter with us to the Chincoteague National Wildlife Refuge. While Seth and Will fished from the beach, we would explore this renowned birding spot. After we dropped those two at the shore, picking up a new lifer, Bank Swallow, in the process, we saw the species that accrues more fame to Chincoteague than all of its birds combined: the wild ponies. 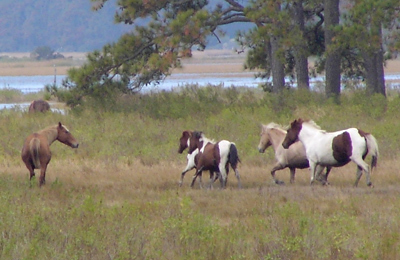 Assateague Island and the Chincoteague NWR are known far and wide for the wild pony herds that roams the wetlands. 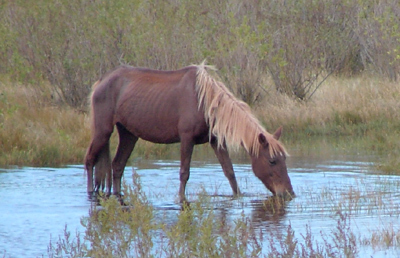 These feral ponies subsist on a variety of marsh grasses and even drink sea water. I was anxious to see them, and I was not disappointed. We joined a crowd of onlookers watching a herd running wild pretty close to the road. They were superb. The Chincoteague Wildlife Loop is really a wonder. It circumnavigates a massive pond and takes pedestrians and bicyclists though sensational, though partially beetle damaged, pine forest. The pond was another infinity of egrets. This time though, we added Little Blue Heron and a Tricolored Heron to the weekend’s tally. There was a further abundance of gulls and terns and the expected vultures, hawks, eagles, and osprey. Actually, there were a couple of mature bald eagles, and I don’t know anyone so jaded as to ignore this majestic bird in full fledge. We also saw another Northern Harrier. The unexpected bird here was an immature White Ibis, well out of its range and without any peers, but there just the same. From what I’ve learned, this solitary bird has been mingling with the egrets since early summer. It certainly wasn’t shy! The extralimital ibis was the last bird of our day. We were in a rush, so we didn’t even scratch the surface of this world-class birding environment, but we look forward to returning.